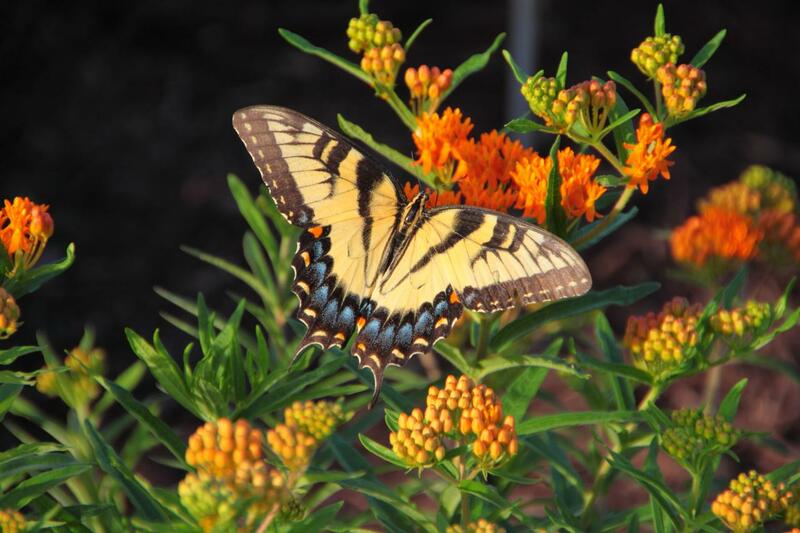 A Tiger Swallowtail Butterfly munching on a flower in our backyard. Grañon was my favorite place along the Camino. It was a place along the Camino that felt ... right. 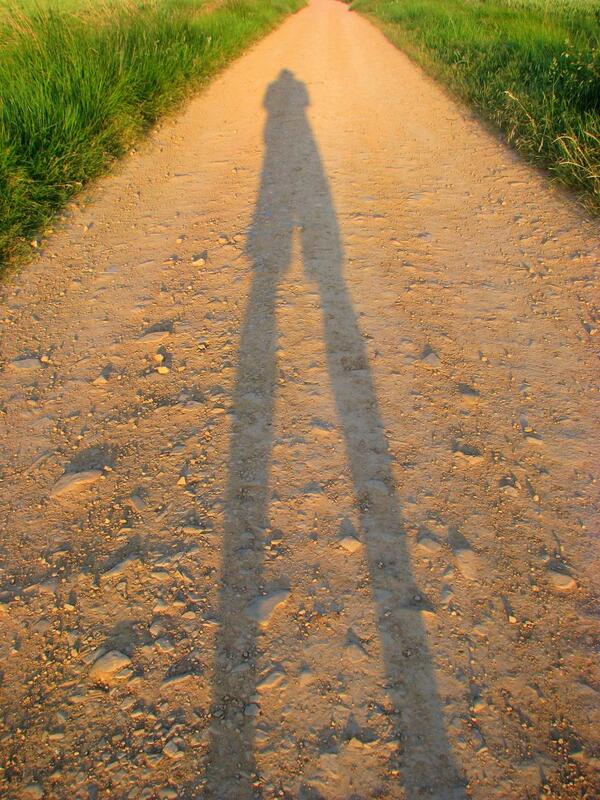 Everyone with a camera probably took a picture like this during their Camino. 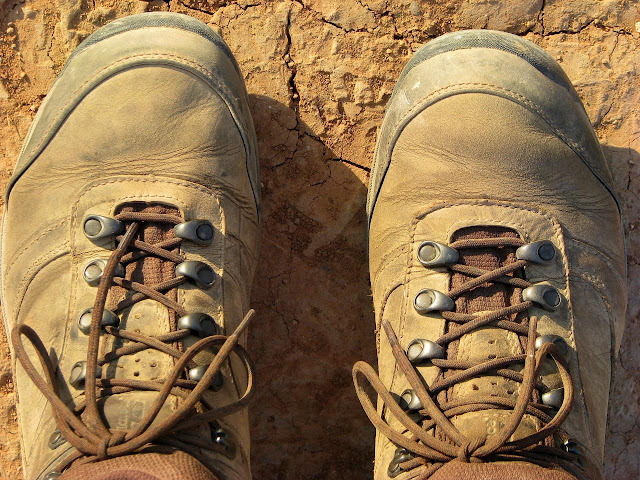 All the pilgrim's shoes, no matter what color they started, ended up Camino dust brown. A green grain ocean with red poppy breakers lapping the Camino. The great room in the Grañon albergue. The most content and happy time I enjoyed on the Camino was here with these people. 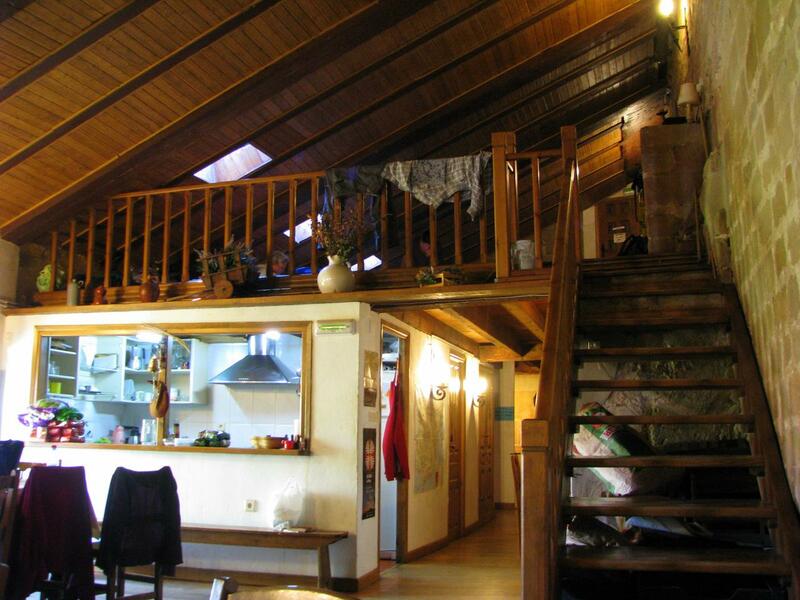 The sleeping loft in the Grañon albergue. A pilgrim in stained glass. A window in the Grañon church. I left Azofra for the next destination along the Camino. All drugged up I walked well. The Ibuprofen was working fine but despite that I knew this couldn't go on. I decided during today's walk that I would take two whole days off once I got to Burgos, three days down the Camino, to allow my ankle to heal. 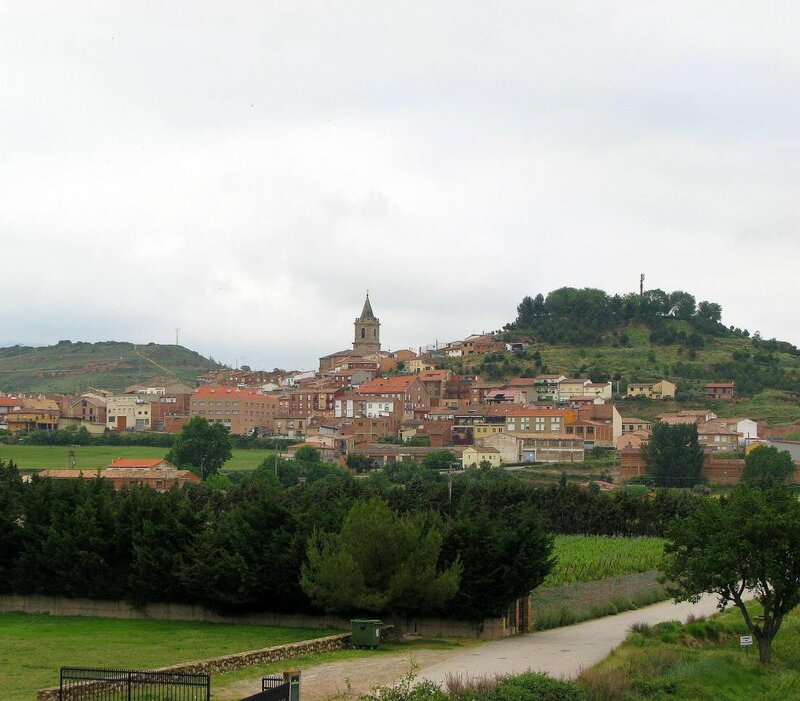 I arrived to the town of Cirueña. I stopped and took a picture of my boots - I just had the thought as I was walking along how all the pilgrim's shoes were all the same color - Camino dust brown. The Camino passed an empty golf course and rows of brand new, and empty, apartments/condos. By the sorry state of the landscaping and the windows there was no one living there. A ghost town created by the wonky world economy. I passed several half built ... and abandoned ... homes along the Camino. At a corner was a small park sitting area with some plaque if I remember right. To my surprise, GV, LO, and NV were all there taking a break. I was surprised as GV was a late riser and she was invariable behind me - that is, until today. LO had been battling foot problems and was not doing well this leg. 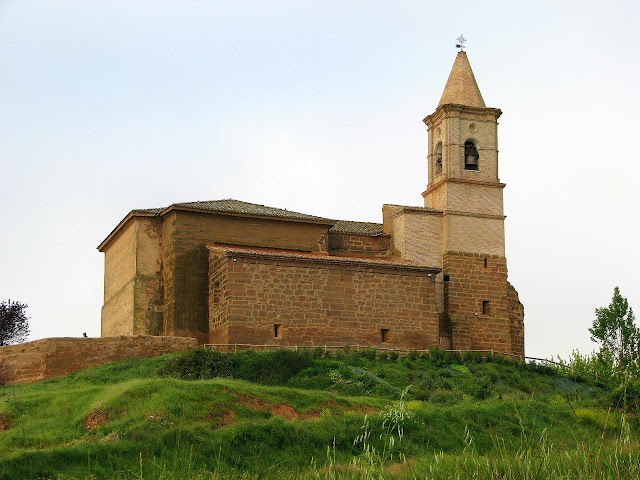 We all agreed to stop in Santo Domigo de la Calzada (Saint Dominic of the Road). After sitting with them and snacking, I got up and hobbled along the Camino. Your feet tend to numb up after you walk awhile. If you stop to rest the numbness goes away. Restarting means you have to regain the numbness. GV said I was limping pretty bad when I left them in Cirueña but I was fine by the time I got to Santo Domingo de la Calzada. The albergue was still closed for cleaning so we stopped at a bar and got some brunch (I had a piece of Tortilla Española, bread, and a glass of fresh squeezed orange juice). After sitting for a while we all looked at each other and decided that we still had some walking in us so we decided to move on to Grañon, 4 miles (6.5 km) farther ahead. LO, who didn't want to miss NV's birthday, decided to take the bus to allow her feet to rest. The walk to Grañon was hot. 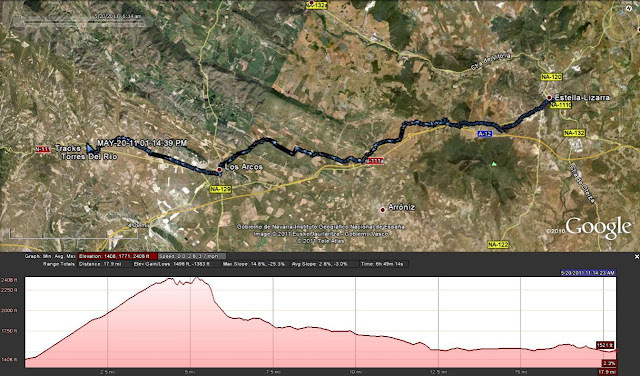 To make it worse the Camino takes you in a circuitous route that adds distance to the walk. To make it even worse, you could see Grañon in the distance as you walked this circuitous route. 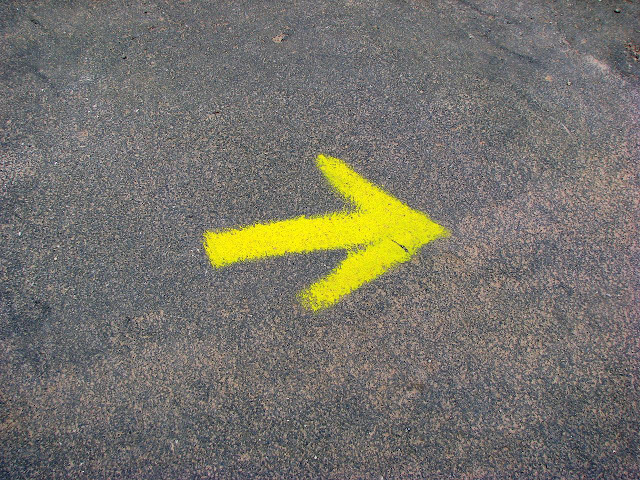 The sad part was there was a shorter way to get there but most of the pilgrim's dutifully followed the yellow arrows around the longer way. The Grañon albergue was in the old restored Church of Saint John the Baptist. The church had been restored fourteen years earlier and is run by volunteers who work there for one or two weeks at a time. I walked up some narrow and worn stone stairs to a great room with a fireplace, a piano, and SZ. SZ?!? Turns out one of the hospitaleros was sick and SZ had volunteered to help for a couple days. The albergue consisted of a great room connected to a small kitchen. Over the great room was a loft full of sleeping pads. From the sleeping loft you could climb stairs to the laundry area. Farther up the narrow stairs and you reached the bell tower where you had great views of the town but had to be careful as the bells were rung on the hour. After I signed in and did my chores everyone started showing up. LO, NV, HT, GV, KT, JN, ST, SP, GU, LS, and CL (and friend). I also met RT (Germany) and MR (Brazil, she had also volunteered at the albergue). As I looked around the albergue HT introduced me to RN (Omaha!!!). The gang was getting bigger. I went down to the great room and SZ shoved a plate of leftover pasta in front of me which I devoured heartily. That afternoon SP, LO, and HT all took turns at the piano. SP, the best pianist in the bunch also turned out to be an awesome classical guitarist. As I sat there listening to the music and seeing the weary pilgrims resting I thought this was what I'd imagined the pilgrimage to be. It made me smile and that moment made the 148 miles (238 km) I'd walked to get there worth it. I realized there and then that it wasn't the walking that made the Camino so life changing, it was the people you met along the way. This was the Camino. The evening meal was a communal affair. Folding tables were brought into the great room transforming it into a dining room for forty-five. The remaining hospitalera, along with another volunteer who came up from Logroño, talked to the pilgrims, telling us of the history of the Grañon albergue, how it was all volunteer, how they had communal meals every night, and how they never turned any pilgrim away - once serving dinner to over ninety pilgrims at one sitting. The multi-course meal was then served. The meal had been prepared by the hospitaleros with help of the pilgrims. We had a salad, a lentil stew, a fruit salad (prepare by a German lady who was missing her daughter's birthday - the fruit cup was made in her name), and the whole thing ended with a birthday cake/tort made by LO for NV's birthday. Happy Birthday, or the national equivalent, was sung in English, Spanish, French, Italian, German, Dutch, Portuguese, and Korean. The tort was delicious. We all had a great time and I doubt NV will forget that birthday any time soon. Day ten was, except for the sleeping, near perfect. This is what I'd signed up for ... sadly, by my own stupid actions, it would not continue. 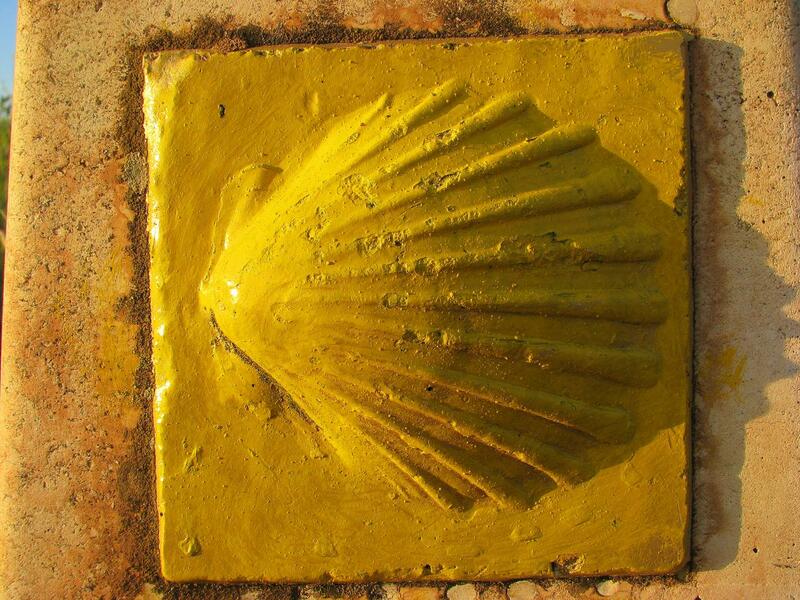 A bright yellow shell Camino marker. On this stretch of the Camino I took a lot of pictures of Camino markers. 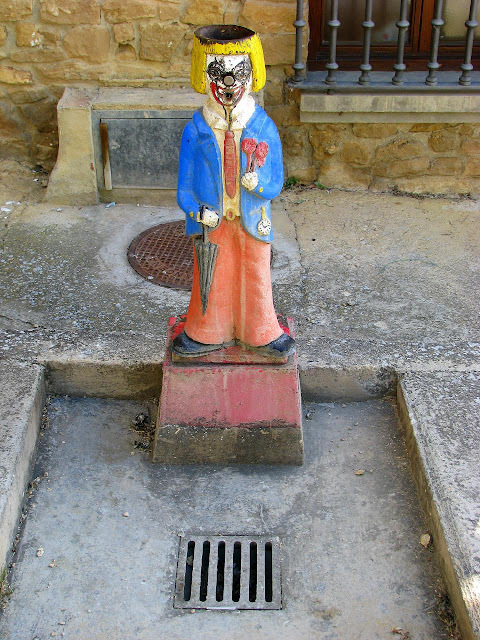 Another common marker on the eastern end of the Camino. Early on these were as common as the yellow arrows. Approaching Azofra, my destination for the day. I've added these pictures to my 2011 Camino de Santiago Google Photos album. 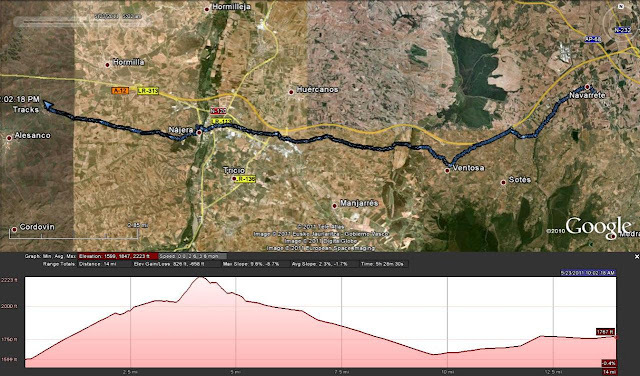 I'd thought about doing a second short day and stopping at Nájera, 9.94 miles (16.00 km), but instead I went on to Azofra. My ankle was even worse today. On top of that the Camino was starting to be a little urban and the scenery was not very inspiring. When I passed through Nájera I saw a plaque describing the battle between Roland and the giant Farragut, names I've heard of but knew little about. I told myself that I would read up on this (which I haven't done yet). In Nájera I bought a Coke and my energy picked up. This would become a pilgrim trick. When you were within an hour or so from your destination drinking a Coke (leaded, not unleaded) would give you that extra little boost you needed to get there. You had to watch out because drinking it too early would often result in a crash before you arrived. 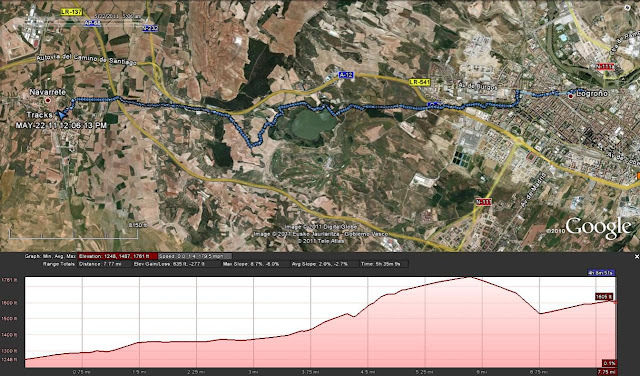 The Camino took what felt like a circuitous route through the city but, after looking at my GPS track, it wasn't that circuitous. I remember thinking I was lost so that's probably why I felt that way. I also wanted to stop at a pharmacy and, for some reason, passed by several without stopping. I guess I was in special form this day. I reached Azofra and did my chores. In the process I discovered that my left big toe appeared infected. I've lost my toe nails before but this time the big toe developed a blister under the nail. It was kind of gross - the nail had a yellowish hue - but it didn't really hurt as I walked - more bark than bite. In Azofra I noticed a definite redness around the nail, especially the nail bed, which suggested to me that it was infected. I took a needle to the blister and drained the fluid from under the nail. The good thing was the fluid was mostly clear so I thought it might not actually be infected after all. I wrapped it up so it wouldn't gross out people. The albergue at Azofra turned out to be quite posh. The pilgrims described it as a resort. The beds were arranged two in a room and there were no bunk beds. Each two person room had a locker and even had a door that could be closed. I ended up paired with a fairly quiet gentleman who only moderately snored. Adding to the resort atmosphere was the truly wonderful spring weather and the cool wading pool. I spent the afternoon alternating between icing my ankle and soaking it in the wading pool (being sure to keep my toe out of the water). The cold wading pool water felt a lot better than the ice. I did anger the hospitalera a bit. When I hung my clothes out to dry I took up too much line. She started taking my stuff off the line and, when I tried to take the now dried clothes to free up the line, she wouldn't give them to me. It turned a little heated - mainly due to the language barrier. I apologized to her after everything cooled down - I was her guest after all - and we became instant friends. That evening EN, GV and I went out to eat. 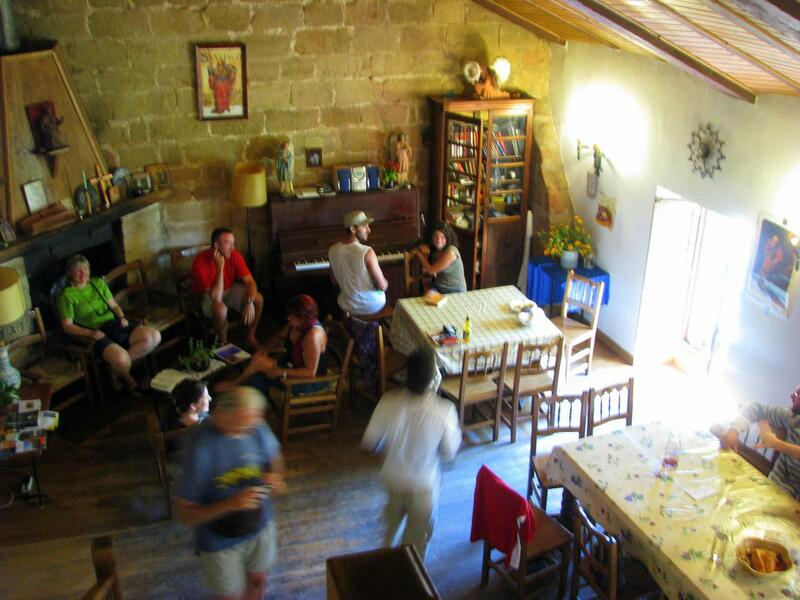 We came back to the albergue and joined a group at the table and enjoyed the people around us. I think this is where the group of people I came to know and love came together with the addition of ST (Australia), SP (Canada), CL (Columbia) and her best friend whose name escapes me (I thought he was her husband for a while), GU (Italy) and her Mom LS. I can't say I was close to all of them but they became people I was happy to see along the Camino. Everyone had enjoyed this day at the resort and we all were relaxed ... many helped by the four bottles of cheap wine on the table. 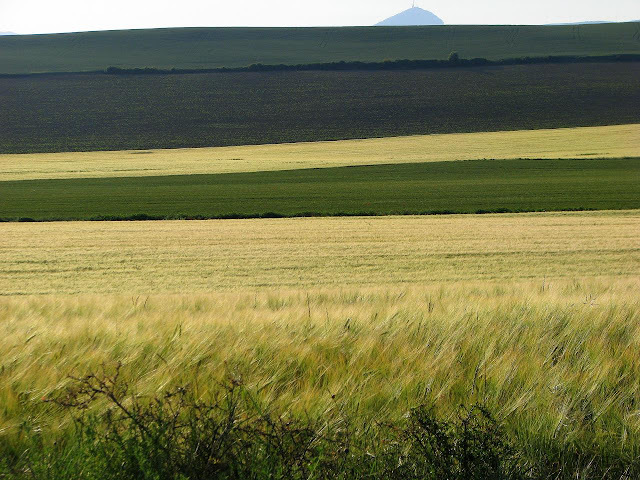 Day nine was uneventful ... a typical day on the Camino. The ankle was a distraction that I pushed out of my mind as best I could. I was surrounded by good people and I didn't want anything to spoil my adventure. This was a short leg so I only have a few pictures. 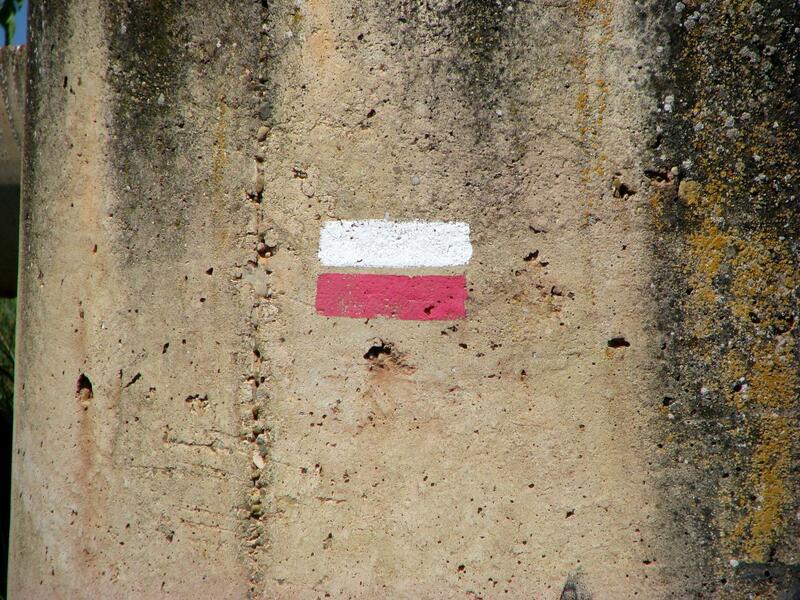 I'll start with one of the most iconic images of the Camino. The Yellow Arrow. The most common marker along the Camino. Nothing fancy but hard to miss and always there when you need it. 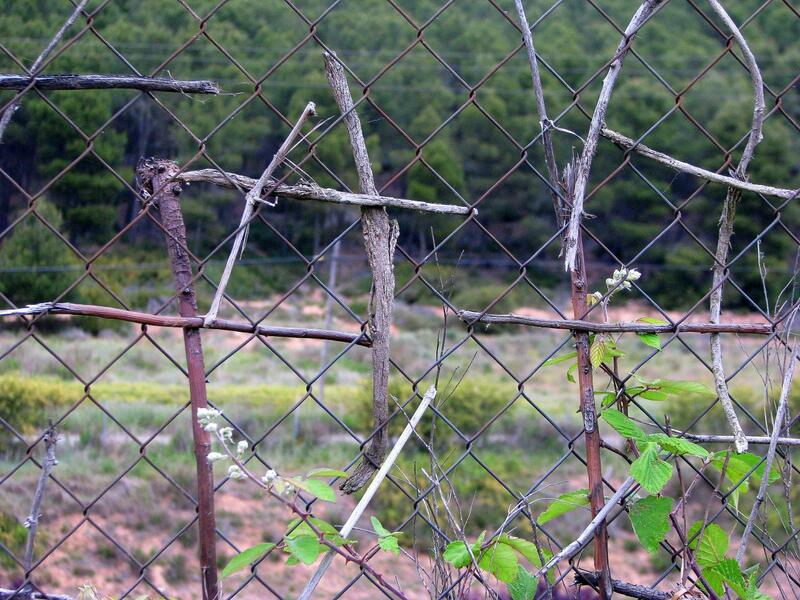 Crosses on the chain link fence. There were so many the view of the highway was blotted out in places. I added one of my own. Approaching the town of Navarrete. Our Lady of the Assumption Church in Navarrete. My ankle was hurting enough that I decide to do a short stage. I was hoping a little less walking would help the ankle heal. I left town early Sunday morning. Ahead of me were the four Norwegians I'd shared dinner with in Puente La Reina ... singing. I have to say they had wonderful voices. 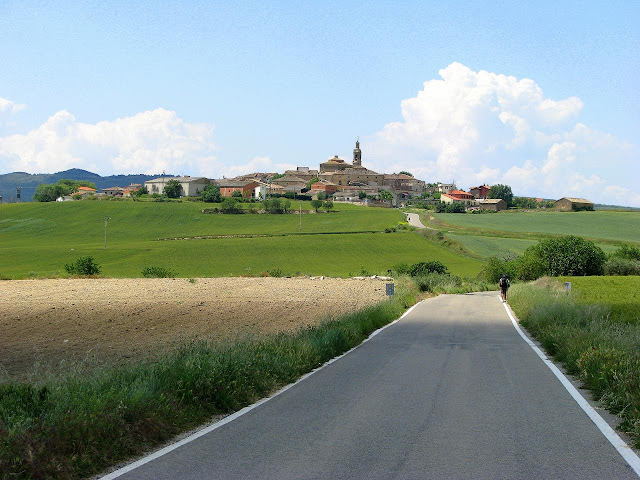 The Camino went uphill as it left the city. It reached a reservoir and crossed a dam. People were on the dam fishing. On the other side of the earthen dam was a small park where I ran into EN. EN had had some major foot and blister issues since her first day. In Logroño she bought new shoes. I asked her how her new shoes were and she said they were much better. They must have been because I didn't see her again for awhile as she raced ahead. Farther ahead I came across the Hungarians (my hosts in Puente La Reina) trying to coax a squirrel off a tree with some food. It was cute. I passed them and continued on. I passed a self proclaimed "hermit" selling stuff along side the Camino. Once again I did not stop. I should have as he had a sello (credential stamp). I told myself I would stop for these 'special' sellos from now on. The next stretch was within sight of the highway. A chain link fence separated the path from the road below. Pilgrims had stuck sticks and grass in the fence making crosses. Parts of the fence were completely full of crosses blocking out the view of the highway. It was cool. I added a cross of my own to the fence. 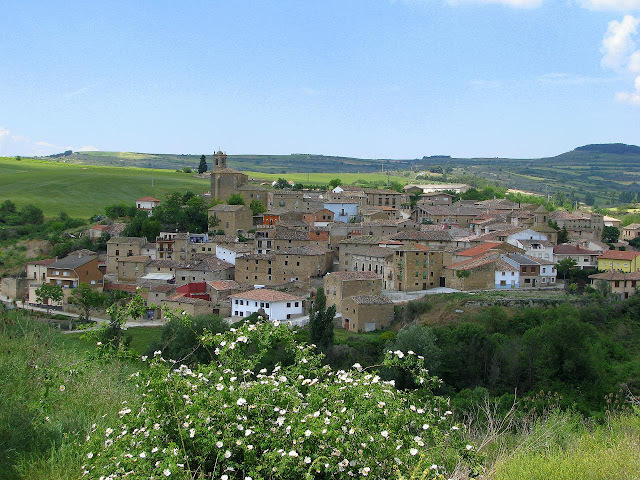 The Camino dropped back down as I entered the town of Navarrete. I walked around and found the albergue. Since I 'd kept this leg short it was really early, before 10:00 AM, and the albergue didn't open until 2:00 PM. I had time to kill. I seriously thought about continuing to the next major town, Nájera, but I thought about my ankle and fought the urge. The bar/restaurant next door to the albergue was open so I bought something to drink while I waited. The Norwegians and the Hungarians showed up and stopped at the bar for their morning coffees. I talked with them for a while. I told them I was not going any farther because of my ankle and we said our good byes with hugs and smiles. They were good people. I felt like I should have gone with them. I walked around a little visiting the church. When I got back to the bar there was HT, GV, and LO. LO had had some major foot issues (probably tendonitis) and had taken the bus from Logroño. She was joined by GV who wanted to rest the huge blisters on the bottom of her feet. HT had walked from Viana where he'd spent the night. I was once again happy to see familiar faces. While we waited for the Albergue to open HT bought some tortilla (technically Tortilla Española or Tortilla de patata). Unlike the tortilla back home - a type of Mexican flatbread - tortilla española is more of a tort/omelette made from eggs and potatoes and fried in olive oil. I didn't try it in Navarette but I did later on and never regretted it. It was a perfect breakfast food ... if they would serve it at breakfast time ... which they rarely do. The albergue finally opened and we got in, got beds, cleaned ourselves, and cleaned our stuff. The usual routine. I hung my washed clothes on a rotating clothes line outside the window of the sleeping room (Thank you safety pins). In the kitchen/dining area the hospitalero (The person in charge of the albergue) was making crepes and giving crepe making lessons. I skipped on the lessons but I did eat my first chocolate crepe. Not my favorite food but it wasn't bad either. GV said that she was going to cook herself dinner. I offered to buy the food and do clean up if she would make and share her meal with me - the pilgrim's equivalent of I buy, you fly. She accepted. We went shopping, which on a Sunday in a small Spanish town, was not the easiest thing to do. The only thing open was a strange candy store. It predominantly sold candy and ice cream but it also had some regular food stuff in one corner of the small store. GV picked out some pasta, tomato sauce, canned mushrooms, and other things that would work in pasta sauce. That night we had a good meal. While I usually avoid mushrooms, they tasted damn good. I discovered that many things I didn't like in the States (dulce de leche ice cream, mushrooms) tasted just fine in Spain. We had extra so we offered it to HT ... and contributed to his superpower. During our stay in Navarrete I met two more Americans: KT, 72, from Ventura, California (close to where I used to live) and who had served at Offutt Air Force Base (Near Omaha where I live now) and JN, a student at NYU (whose father is from Valentine, NE). I also talked with NV. I still can't remember if I met her in Logroño but I definitely talked with her in Navarrete. She complained about not sleeping because of all the snoring and I gave her a pair of purple earplugs (I had several sets). These earplugs would be an early birthday present. We celebrated NV's birthday two days later in Grañon - but once again I get ahead of myself. I was going to ice my ankle while I was in Navarrete but I didn't. Should have. Live and learn. Day eight was in the bag. I had a good day in Navarrete. Tomorrow ... Azofra. About half way through the Camino my right leg started aching. It would wake me up in the middle of the night, usually 3:00 AM, and just ache. Ibuprofen did nothing but acetaminophen (Tylenol) did. This ache was what got me started on the 1,000 mg of acetaminophen before bed habit. This ache persisted. The leg ached in the car all the way along Route 66, up the California coast, and back to Nebraska. It got better and got worse but it never went away. So what's causing it? A twisted sacroiliac joint. In other words, a twisted pelvis. When the doctor examined me he notice that my right leg was a hair longer than the left, a result of the twisted pelvis. The twisted pelvis is stretching the muscle between my right buttock and my knee. This stretching is making my muscle ache. This would also explain the tight feel I have in my buttock (Please, no tight A$$ jokes). What's the solution? Stretching exercises twice a day. If I'm not better in four weeks then I may have to undergo professional physical therapy. During our Route 66 vacation, when we got to California, I wanted to do a hike. The hike I chose, and will post about whenever I get to the Route 66 vacation - probably next year - was up Topa Topa ridge. It was tough. The day after the hike my right knee just killed me. It was a little hard to walk. The pain persisted for about five days. So what's causing it? Excessive Lateral Patellar Compression Syndrome. My patella (knee cap) is being pulled to one side out of the groove it usually moves in. This causes pain and noise. This is actually related to the twisted pelvis. The stretched thigh muscle connects to the patella and is pulling it off center. What's the solution? More exercises to strengthen other thigh muscle to compensate for the stretched muscle. Again, a month of exercising twice a day should do the trick. A couple weeks ago, my second toe (the one next to my big toe) on my left foot started hurting. It was painful when I walked barefoot but was not painful to the touch or when I flexed the toe. It was tolerable when I wore sandals/shoes and it usually got better by the end of the day but then was bad again the next morning. It's a weird pain. So what's causing it? Not really sure. x-ray didn't show anything. The doctor suspects an inflamed ligament or tendon. What's the solution? Anti-inflammatory pills - heavy duty stuff. The final nail in the "Camino will make me healthier" self-delusion was the results of my blood test. Six months ago all my numbers (Triglycerides, Cholesterol, LDL, ratios, Glucose, A1C), except HDL (good cholesterol) were in the normal range . This time they were all out of spec. The high Glucose number, the average blood sugar for the past three months, really wasn't a surprise to me. My eating habits in Spain, within the three month average window, were terrible. Those who weren't there will find out why my blood sugar was so high once I reach the Burgos posts. I developed a very unhealthy habit after Burgos. I blame NV and LO. So, there you have it. I'm officially a mess. Any benefit I may have received from the Camino was effectively squashed by my bad eating habits. I'm now home and I'm back on my usual routine. I will be keeping a very close eye on my food and I am starting to ride my bike (RAGBRAI is just around the corner ... in two years). Hopefully by January I will have wrestled my aches, pains, and numbers back into submission. Day seven, the last of the 'walls'. At least that's what I kept telling myself. It was a tough day for me even though it was relatively short. The sunshine and cloudless skies which make for awesome views and incredible landscape shots also make you sweat. To make the sticky sweat-ness even worse, my ankle was not responding to the Ibuprofen this day and it was really bothering me. My right ankle was double the size of my left. On top of the heat and the pain, this stretch of the Camino wasn't very inspiring. At least I don't remember it being so. I only remember a couple things about the walk. The first is a confusing signpost that seemed to point in two different directions. I showed this to a fellow pilgrim and we pondered it a while until a man, who appeared to be living with his family out of his van, came out and pointed us in the correct direction. 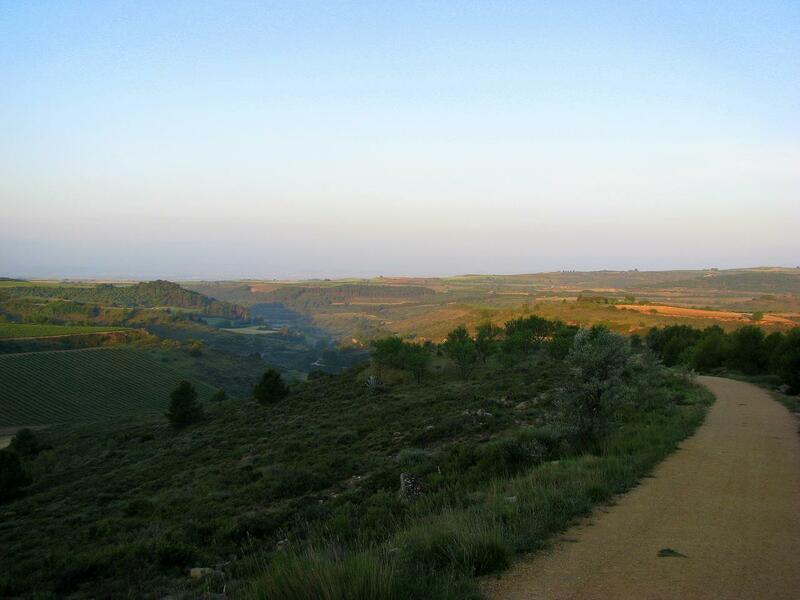 The second was the Las Cañas Nature Reserve. The Camino passed by this large marshy area where birds like to roost. I was too hot, and my ankle hurt too much, for me to really appreciate it. 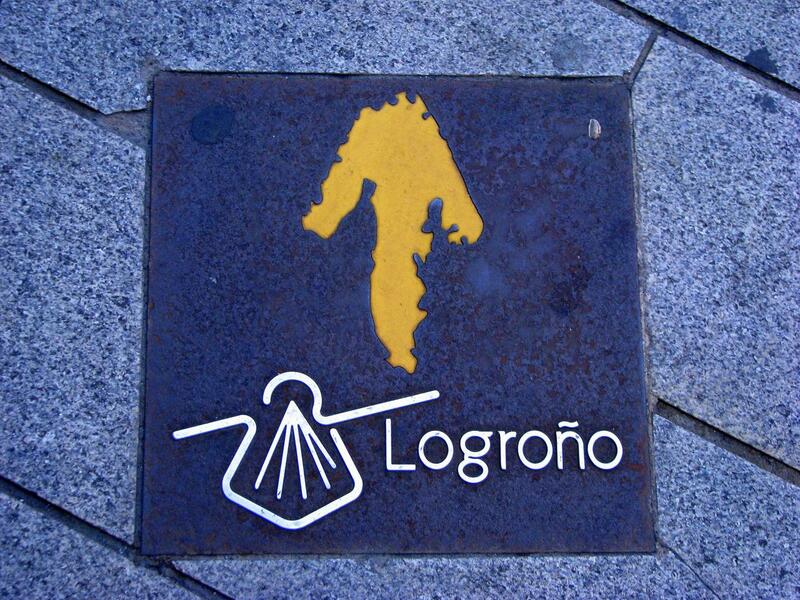 I entered the city of Logroño. I passed an old lady selling stuff. I should have stopped as she also had her own sello (pilgrim's credential stamp) but I just wanted to get to the albergue. 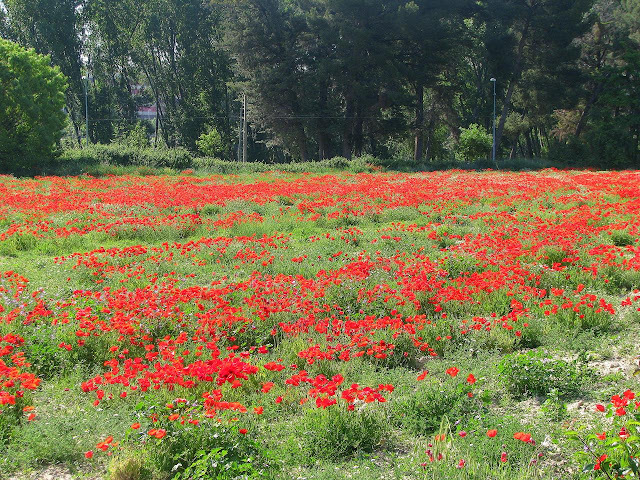 I passed a field of poppies which did lift my spirits a bit. 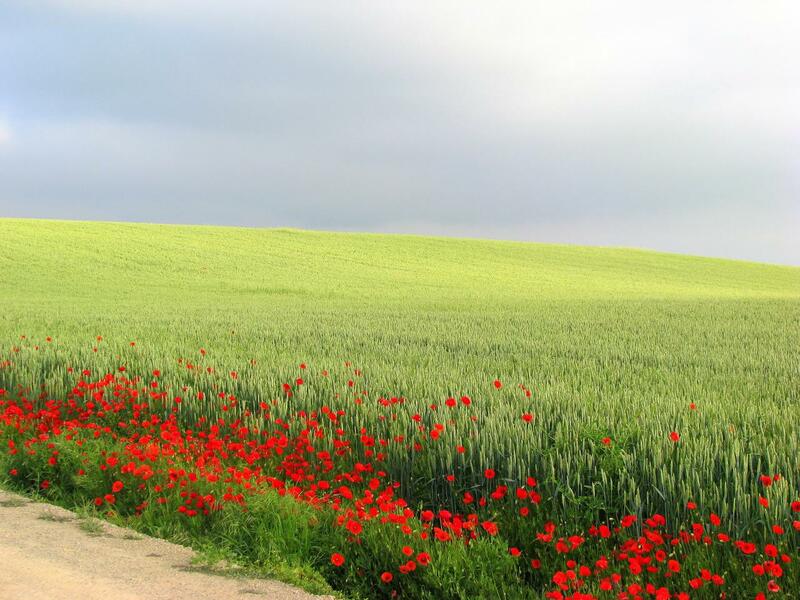 The poppies were a welcome splash of color along the Camino. I saw the word "Municipal" out of the corner of my eye. Thinking it might be the Municipal Albergue I took a closer look. It was the Municipal Crematorium. While I felt dead on my feet I didn't think I was ready for that quite yet. I crossed a cool bridge, reached the albergue, and was fourth in line behind a French girl and two Fins (The next time I would see the Fins was on the way to Fisterra - them heading the other way). While I did my chores SZ, GV, JM, and RF arrived. I think I also met LO (French) and NV (Irish, friend of SB and MN) here though I'm not sure (days and people tend to melt together in my memories and they are sometimes hard to extricate). While they did their chores I went exploring. I found the commercial area of the city and bought some supplies for the next day. I found a pharmacy and pointed to my angle and said "Tendon·ī·tis". The pharmacist looked confused for a second and then said "Oh, Tendon·ē·tis". Heh, yeah, that. 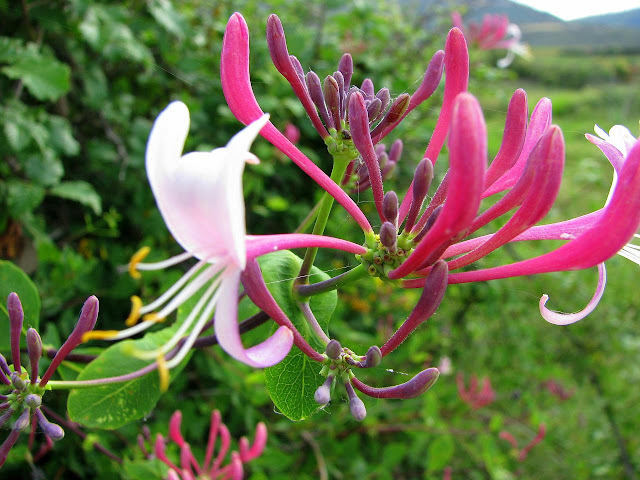 She confirmed that only Ibuprofen, anti-inflammatory cream, and rest would help. I was hoping she would have some treatment I hadn't heard of. 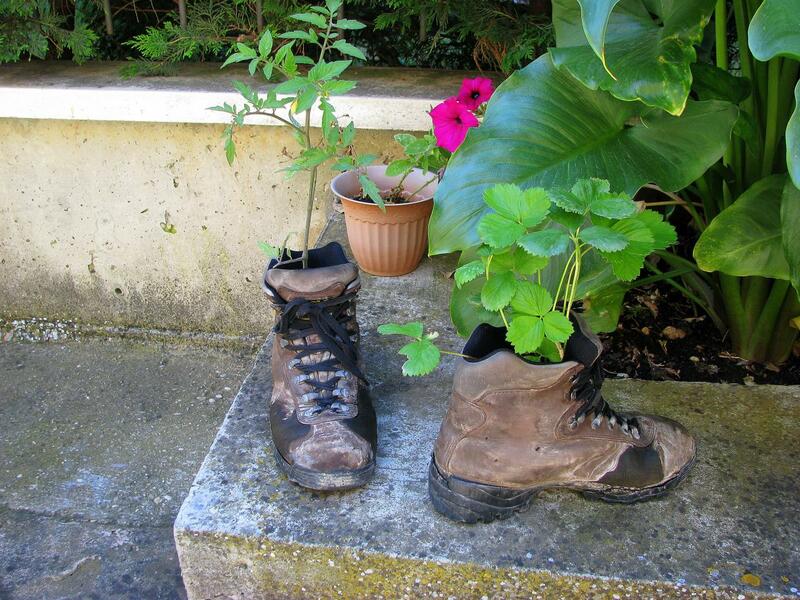 At this time in my Camino I didn't consider rest an option. It felt too early for a rest. I returned to the albergue and eyed the pool/fountain in the courtyard. I took off my flip flops and sat on the edge and soaked my feet in the cold water. It felt awesome and the pain in my ankle temporarily vanished. I was soon joined by EN, JM, RF, SZ, and GV (GV, who got her first blisters on the way into Logroño - big ones - probably got her first infected blister from this pool. Live and learn). Turns out this albergue, and all the others in the city, were full. This didn't happen often in large cities like this. JM and RF got the last two slots in our municipal albergue. 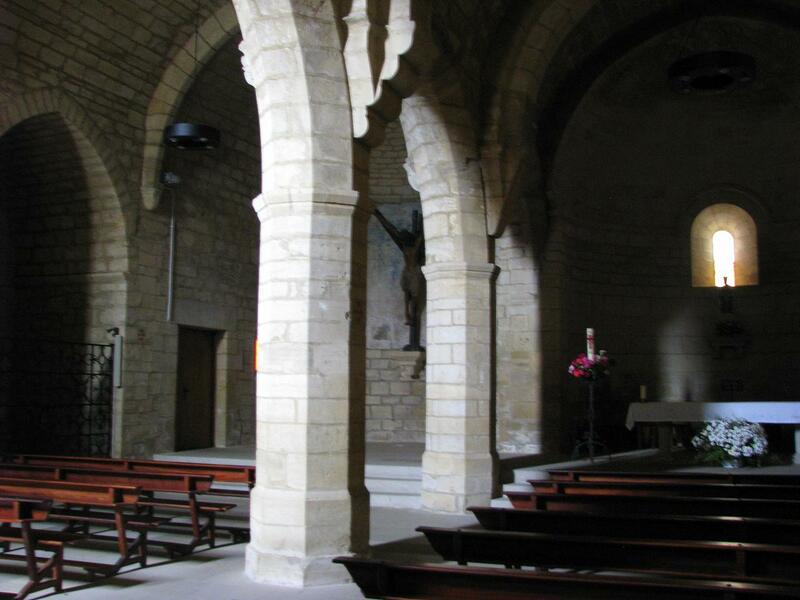 Several other pilgrims ended up sleeping in a nearby church where they were locked in. Since everything was now closed, I took a nap in the late afternoon. When I got up I ran into SZ who needed to buy food. I walked with her and led her to the commercial area that I'd been earlier. She bought her supplies and told me that some of the pilgrims were going to meet at the Cathedral and go out to eat. I said I'd see her there when she headed back to the albergue to drop off her purchases. I wandered around a bit and ended up at the Cathedral. Outside the Cathedral a tent city had formed. Protesters were milling about. They were angry with the austerity programs the Spanish government were implementing. I went inside the Cathedral to take pictures and kill time. I ran into GV there and we chatted while we waited for the others. They never showed. Not sure what happened. After a while we decided we were hungry so we looked for a place to eat and ended at a Doner Kebap, the closest thing to a fast food chain in Spain except they serve Turkish and Middle Eastern food. This one also served pizza and the closest thing to a hamburger that I'd seen in Spain so far. That night at 2:34 AM the protesters decided they didn't like the police station across the street from the albergue and started yelling obscenities at it, waking up the pilgrims in the process. I rarely got a good night's sleep on the Camino but, with all the naps I took, I always got enough. After a day of tolerating a rather painful ankle, the adventure was about to continue ... and while rest was not an option, a shorter stage was. I had beautiful weather for walking this day. A little too warm but brilliant sunshine and clear skies. My destination, Torres del Rio, turned out to be a charming town. 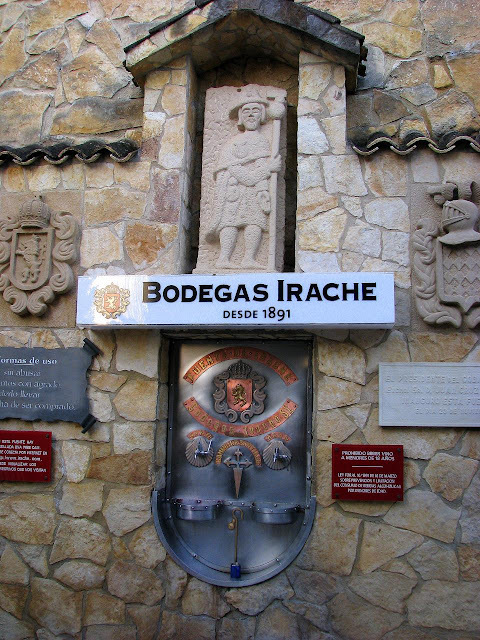 The water and wine fountain at Irache. I expect the wine spigot was more popular than the water spigot. 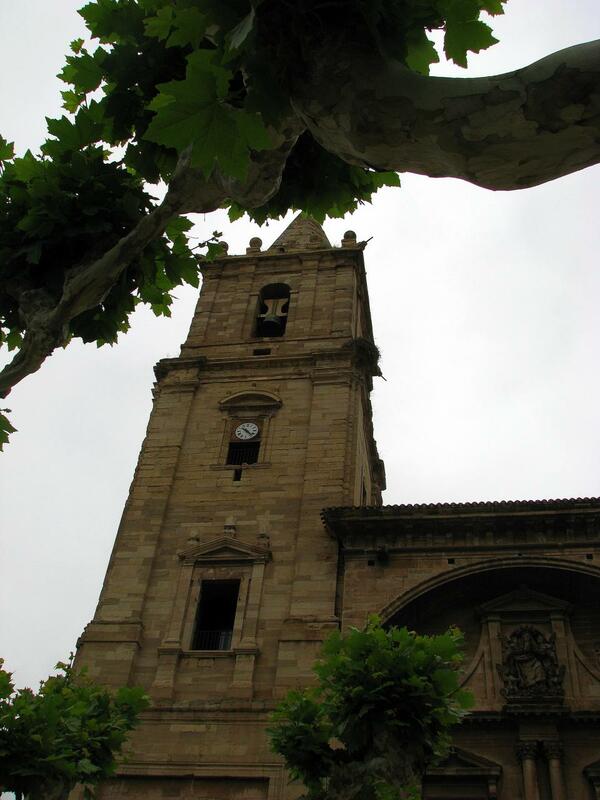 A church tower in Los Archos. I took a lot of pictures of towns and villages as I approached. A couple great examples are shown here. The town of Sansol. My destination is less than a kilometer from Sansol. Almost there. My destination for the day: Torres del Rio as seen from Sansol. 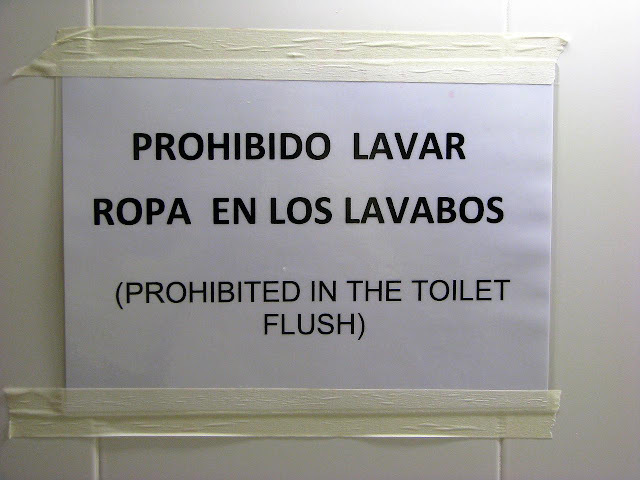 The Spanish says: "Prohibited washing in the toilets." I assume they mean don't wash your clothes in the bathroom. 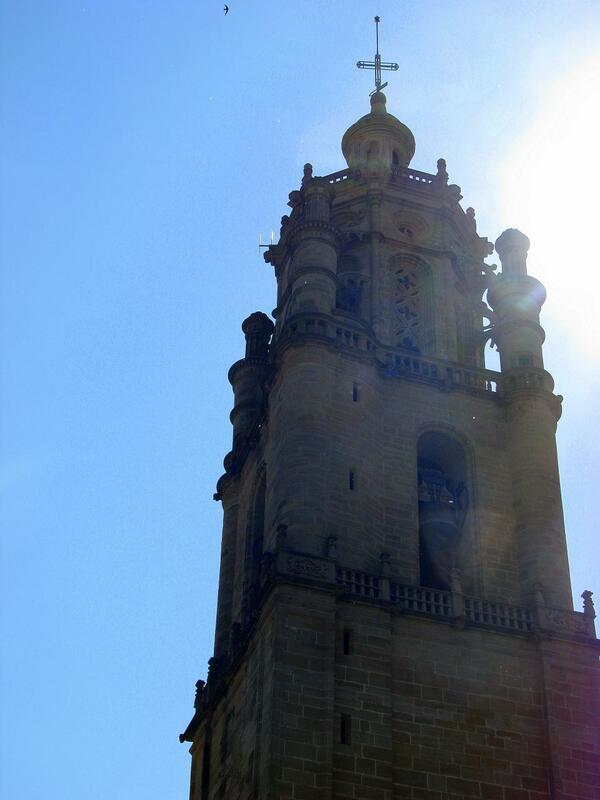 These pictures and more from my Estella to Torres del Rio leg have been added to my 2011 Camino de Santiago. I'm not sure but I think this is when I started dosing myself with pilgrim's candy - i.e. Ibuprofen. I started with 800 mg in the morning before I started walking and progressed to another 400 mg after lunch and another 400 mg before bed (along with 1000 mg of acetaminophen). The ibuprofen worked as I could walk well once the stuff had kicked in. The ankle still hurt but not enough to stop me and I could walk with minimal limping. My goal for the day was the town of Torres del Rio though I had a backup destination of Los Arcos in case my ankle bothered me too much. 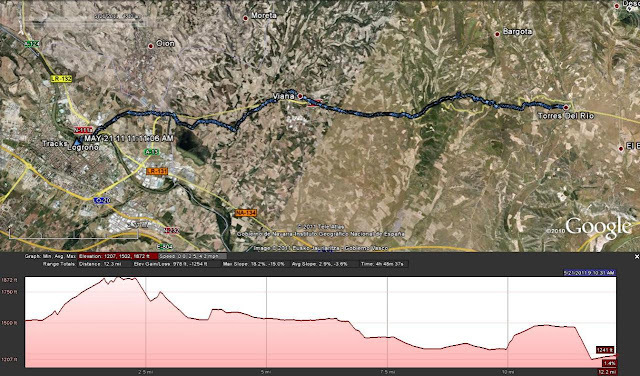 Pushing on to Torres del Rio would make it the longest walking day so far on my Camino. I left the town in the early morning. It was still a little dark and the sun was just rising. About an hour and a half out of town I passed by Irache famous for two things - a monastery and a fountain. Actually the fountain is more famous as it's attached to the Irache Winery. It has two spigots - one for water and one for wine. I found DO here enjoying a cup of the free wine, as were other pilgrims. Not being a drinker of alcohol I passed, though it was tempting. Later HT would tell me a funny story about Irache. 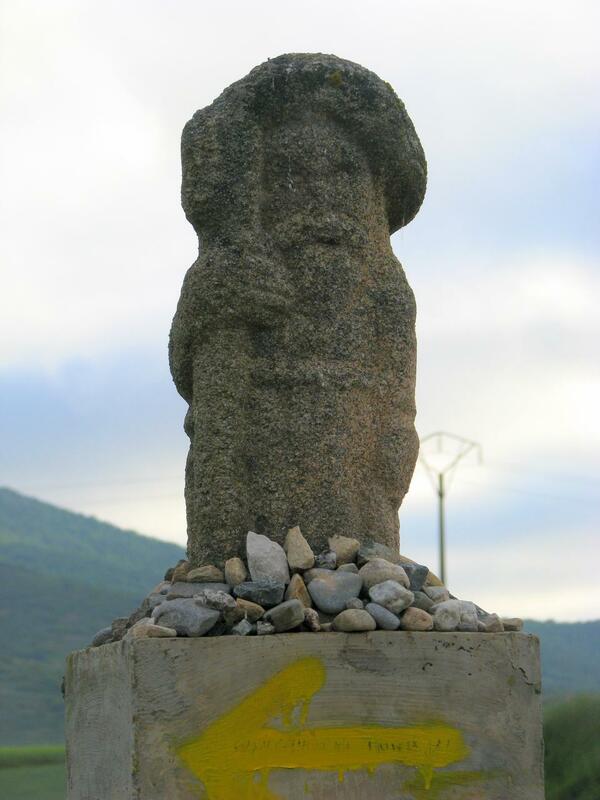 On his first Camino he reached Irache just after a bus had pulled up and disgorged German tourists. When he saw the crowd. he figured he would never get to have a cup of wine but when the tourists saw him they got all excited, the crowd parted, and a cup of wine was handed to him. As this was happening the tourists were dutifully taking HT's picture - an authentic Pilgrim of Saint James in his natural habitat. HA! The Camino passed though a few towns on it's way up a hill. It then went down in a leisurely way as it passed through farm fields. I passed an Asian girl who was barely shuffling her feet. You could tell she wan't in a good place. It would turn out that her insoles were not trimmed properly and her feet were in bad shape. HT, would help her, treating her blisters and trimming her insoles further down the Camino. I ran into HT later that day resting on a picnic table in a small park outside of Los Arcos. As usual he was reading his bible. We chatted a bit as I ate an apple and drank some water before parting ways. Note: This post is turning into an HT love-fest but he really is a nice guy. 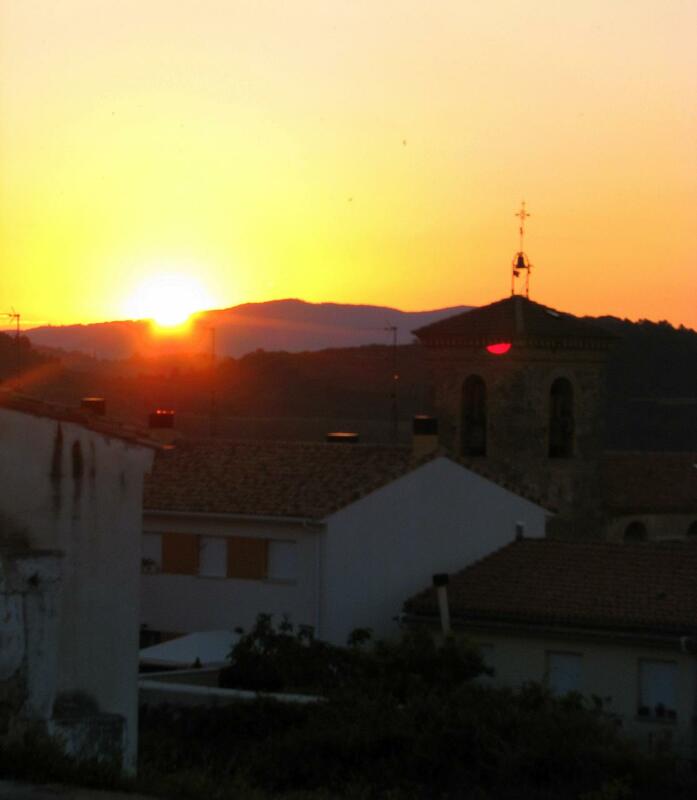 I found my way back to the Camino and left town. 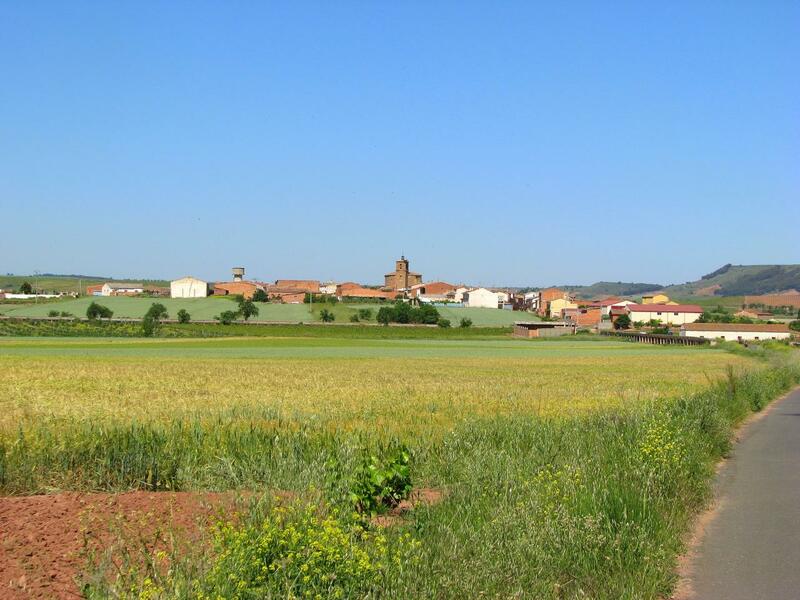 The Camino became a flat, straight dirt road through farm fields. It was also getting hot as the day went on. There was very little shade along this stretch and where there was, a crowd of pilgrims would gather in the shade to rest. Along the way I'd been passing a Japanese man (I'd seen him in Estella and along the Camino before). We kept passing each other while the other rested. After passing me another time he introduced himself to me. 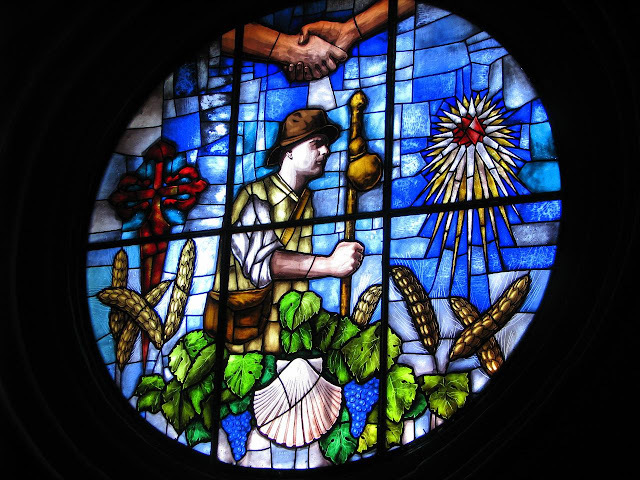 KN was a painter who was walking the Camino taking pictures of things to paint. He said that he thought that Torres del Rio was at least another five kilometers away. I checked my GPS and said that it was less than two. 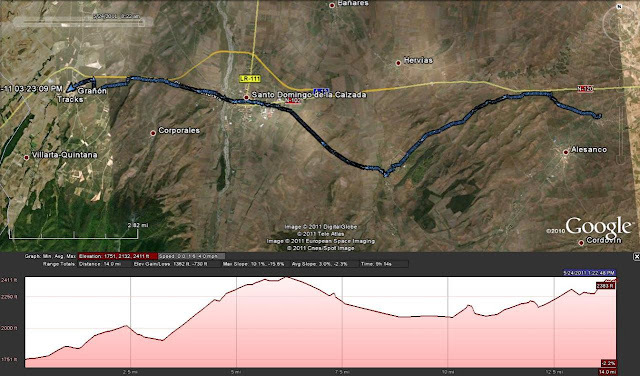 We turn a corner and went up a hill and saw the town of Sansol and we knew the GPS was right as Sansol is less than a kilometer away from Torres del Rio. We walked together the last two kilometers (another one of the exceptional times). We entered the town and found the municipal albergue. KN saw a girl sitting in front and said "Hi" to her and introduced me to her. What she said next surprised me: "You must be the famous Bruce." It turned out that KV and MC not only told me about the California girl but they also told the California girl about me and my travel travails. The California girl's name was SZ, a yoga instructor and herbalist from northern California. There wasn't much in Torres del Rio but it was a charming town with a couple restaurants, a store, and a church that charged you to going inside. There were a couple other albergues and a hotel was being built. We started to notice that the owners of everything were all related. One girl working at the albergue was also a waitress at her husband's restaurant. I got the distinct impression that one extended family owned all the pilgrim related businesses in town. I decided that I really couldn't afford to skip a meal like I'd done in Estella so I joined GV in search for dinner. In a bar/restaurant we ran into the blond haired girl I'd seen in Pamplona. I'd thought she was from Australia based on her accent. Boy, I couldn't be wronger. Turns out JM was from Alabama which was confirmed when she said "y'all". I had to laugh at that. Her friend, RF, was from Germany. We sat down and enjoyed a good meal of pasta, chicken, and conversation with them. That night, after most of us had gone to bed, some older lady pilgrims kept coming in and out of our room. They kept leaving the door open. KN would jump off his top bunk and would run over and close the door behind them. This happen several times. It took a while for them to get the message and learn how to close the door behind themselves. I was both irritated and entertained. 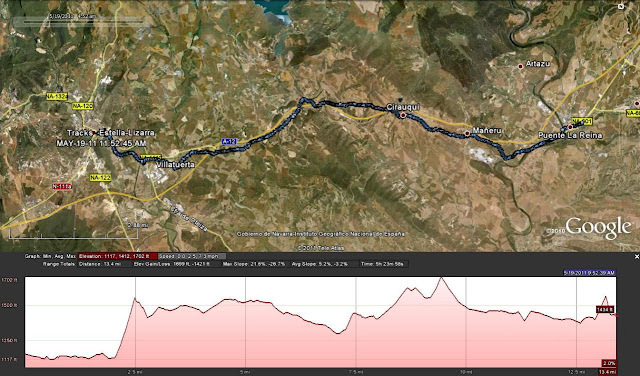 Here are a few pictures from the Puente La Reina to Estella leg. While Estella did not leave me with a big impression, the flowers along the Camino and the architecture did. wind whipped up little ghostly tornadoes along the Camino. Ahhh ... the sweet smell of Jasmine along the Camino. 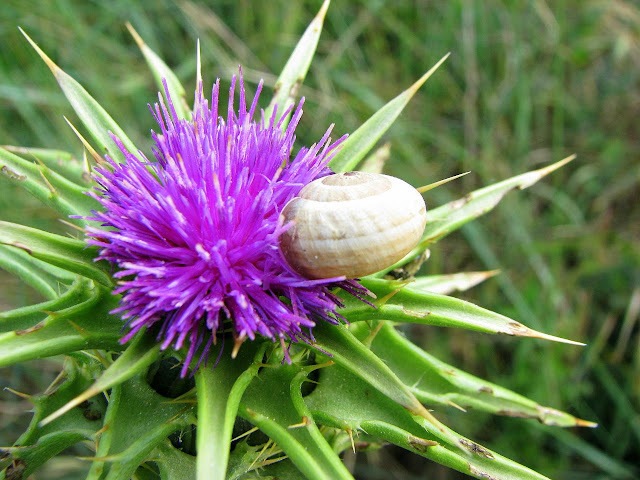 A snail munching on a thistle. Snails and slugs were quite common along the Camino. 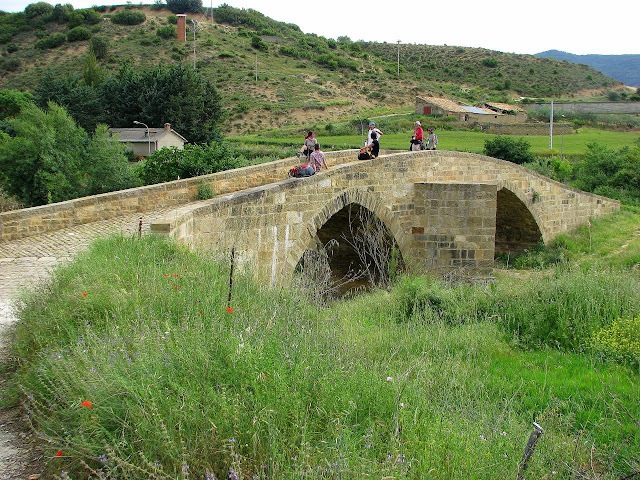 An old bridge outside of Lorca, Spain. Turned out to be a great place to rest. Scary water spitting clown in Villatuerta. Would you drink out of his mouth? I wouldn't. 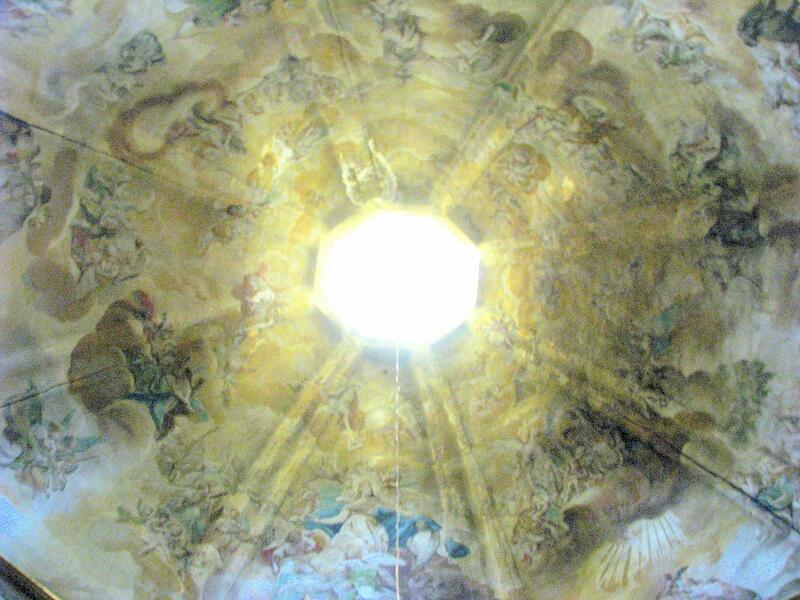 Saint Dominic Monastery in Estella. 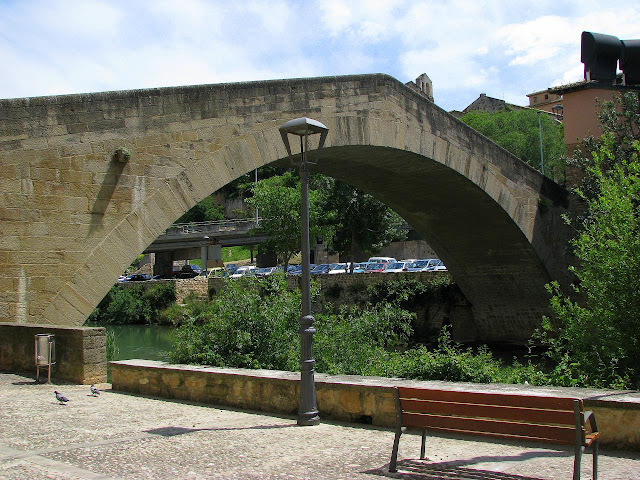 Roman Bridge over the river Ega in Estella. I have added these pictures and more to my 2011 Camino de Santiago Google Photos album (Don't forget to click through to see the whole shebang). Day five turned out to be one of my 'wall' days. The day seemed to go on forever. Despite this when I arrived at Estella I discovered that I had maintained my usual average speed of 2.5 MPH (4 km/h). The slower I felt I was moving, the closer to my average, or faster, I would go. I had a warped sense of time and distance. After crossing the puente (bridge) of Punte La Reina the path roughly paralleled a major road though it was far enough away that it was not a bother. The breeze swirled the cottonwood (or cottonwood-like) seeds along the path. 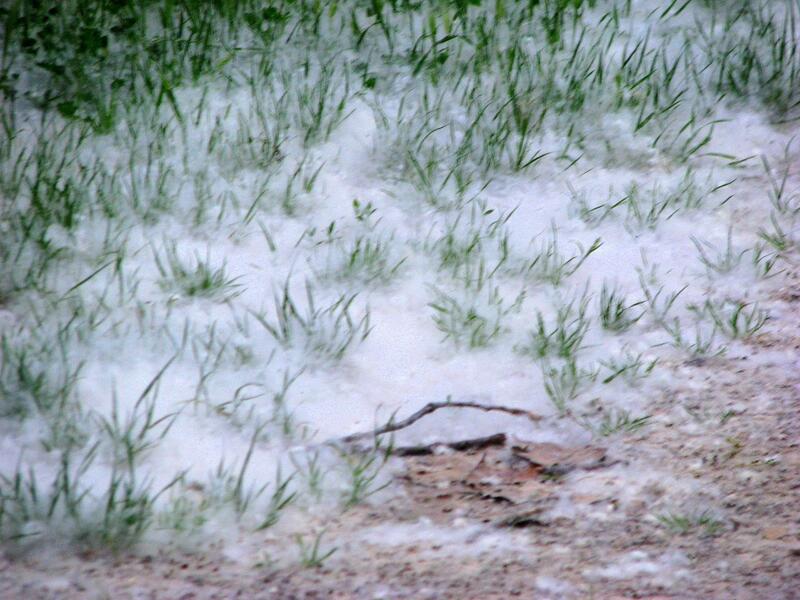 At places little cotton tornadoes swirled as I walked by and at others it blanketed the ground like snow. The walk was supposed to be relatively flat today but the elevation plots I'd picked up in Saint Jean Pied de Port were, as they often were, deceptive. Less than an hour out of Puente La Reina the Camino turned steeply up and, once again, I wondered if I was up to the task as I stopped every five to ten steps to take a brief rest. I made it to the top and the Camino eased up a bit. In the distance I heard the call my first wild Coo Coos. At least I think they were Coo Coos. It could have been the Camino telling me that I was insane to walk across Spain. I also thought I heard whipoorwills but they aren't supposed to be native to Europe so I may have been mistaken. The Coo Coos sounded just like the coo coo clocks I've heard back home. To compliment the Coo Coos were the wild flowers lining the Camino including some wonderfully odoriferous Jasmine. That stuff smells wonderful and reminded me of the jasmine in our backyard in California. While all the bird songs and floral displays enhanced the Camino it was unfortunately countered by a developing pain in my right ankle. The irritation that I first noticed in Puente La Reina was getting progressively worse. I eventually stopped to rest the ankle, and the rest of my body attached to it, on a large bridge outside the town of Lorca. It looked very hospitable with all the pilgrims sitting on the 'railing'. I took off my pack and rested a bit, eating an apple. Pilgrims become experts in transporting fruit. Bananas ... forget about it. Bananas are breakfast food that you eat before you leave as they will not survive the pack. Oranges will survive but they are heavier than apples which also will survive the pack. For a pilgrim, pack weight is paramount. In Spain, the apple was my main walking fruit. I probably ate at least forty apples on the Camino ... probably more. Leaving the bridge the Camino headed up again, went through Lorca, Villatuerta (home of the scary water spitting Clown), and delivered me to the large town of Estella. I checked into the albergue ... after waiting an hour or so for it to open. As we headed west it seemed the albergues were opening later and later. I was the first in line. This gave me a bottom bunk but also put me in a room with some noisy Spaniards who really didn't know how to tone it down. The guy with the raspy voice was particularly irritating at times. When you walk the Camino, it has been said, you should take care of your chores before you lay down or they will never get done. The chores consist of cleaning yourself, cleaning your stuff, and finding something to eat. That's what I did. Showered, shaved, and brushed my teeth. 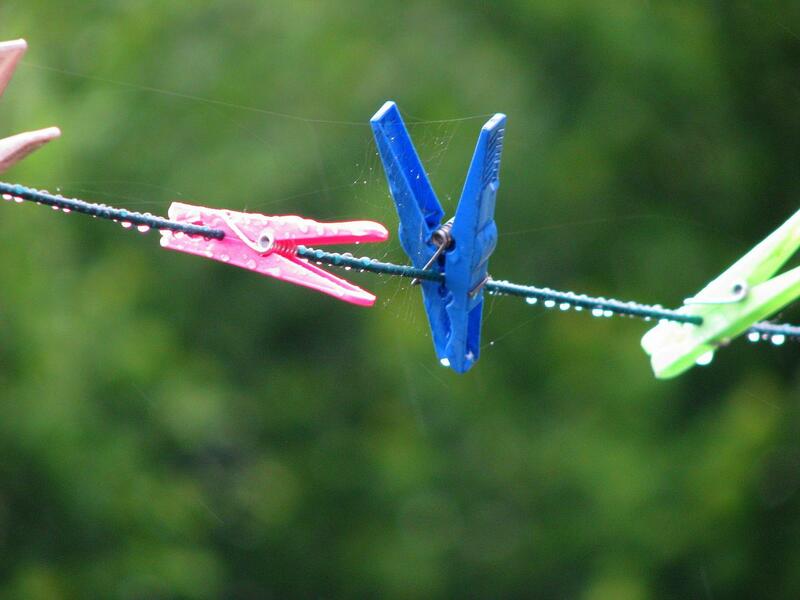 Hand washed some clothes in the laundry sinks (using liquid camp soap) and hung the stuff out on the clothes lines (Clothes pins were not provided but I would find safety pins, something I'd packed, worked great). I crossed over a cool bridge across from the albergue and found a bar open where I bought a bocadillo de jamón for lunch. Finding places open in Spain can be a little difficult at times. Everything closes at 2:00 PM and reopens at 5:00 PM. By the time you check into an albergue and do your chores most places would often be closed. After eating I wandered around town being the tourist. I stopped at a pharmacy that was about to close. I pointed at my ankle and said pain in Spanish. She sold me some anti-inflammatory cream that was all the rage this pilgrim season. I'd seen several pilgrims using it and I would use nearly an entire tube of the stuff before my Camino was over. Since everything was closing (even the churches were closed) I went back to the albergue to slather the cream on my ankle and to rest a couple hours in my bunk. When 5:00 PM rolled around I got back up and went in search of food. I was a bit alone even though there were people I knew in the albergue. My aching ankle sapped some of my congeniality out of me. After looking at a few restaurant menus and finding nothing that really grabbed me I stopped at a corner store and bought something to keep my stomach from growling and some stuff for next day's walk. Talking with fellow pilgrims we discovered that we really weren't hungry much while walking and sometimes even after we'd stopped. For me, food just didn't look appetizing after walking all day and I often had to force myself to eat. This day, in Estella, I did not eat much which would become a bad habit. I went down to the communal dining hall and sat down across from fellow American HT. HT had introduced himself to me when I was in my bunk. This was his second Camino and had started from Pamplona. We were joined by GV and we all chatted for a a while. I admired all the meals other pilgrims were cobbling together from the meager rations sold at the neighborhood stores. HT got some free food and wine after he helped some French-Canadian girls open their wine bottle. That was one of HT's superpowers - getting free food from everyone. HT turned out to be a very nice guy. Estella didn't make much of an impression on me. 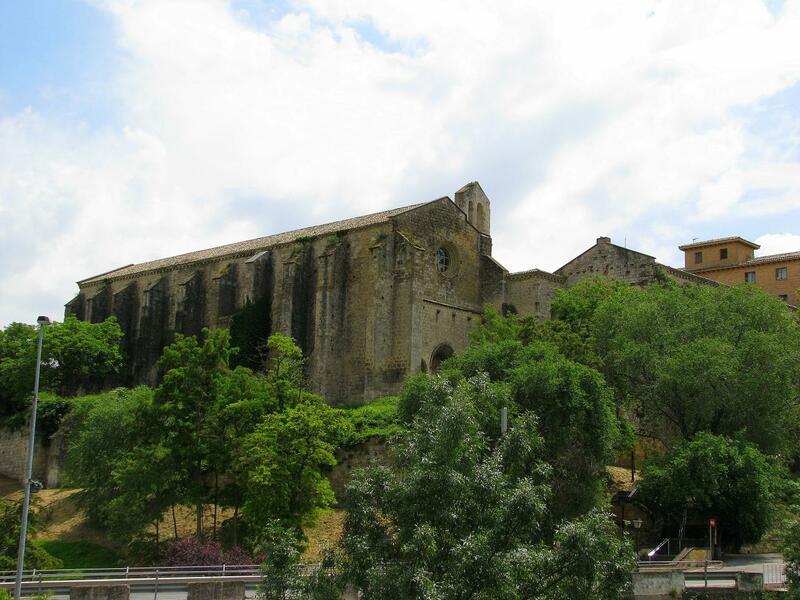 It had a cool bridge, interesting architecture, and a comfortable albergue but, when I think of the towns I went through and stayed at, I often forget about Estella. Not sure why that is. Day five, the second wall, was behind me and I survived. I was ready for the next leg of my adventure. 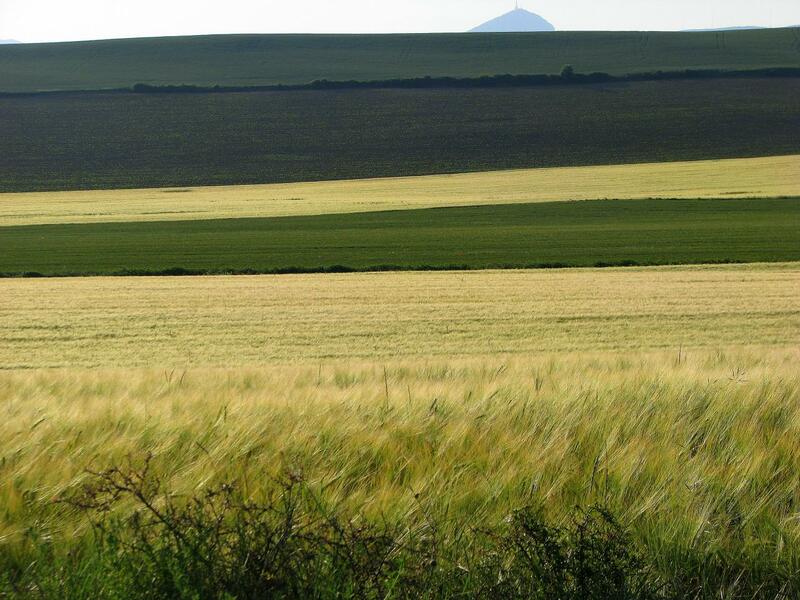 Fields of grain along the Camino. I like the contrasts in the shades of green. The pilgrim's monument at the top of Alto de Perdón. A place to rest and take in the sights. 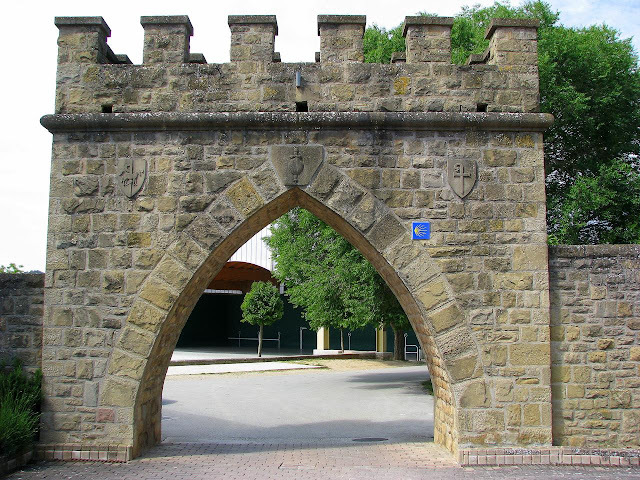 A Castle archway. Note the shell of Santiago guiding the way. A panoramic view of the 11th century bridge built by the Queen for the pilgrims. Note the red tent under the right end of the bridge. A pilgrim preparing for the night. Church of the Crucifix - My first Knights Templar church. 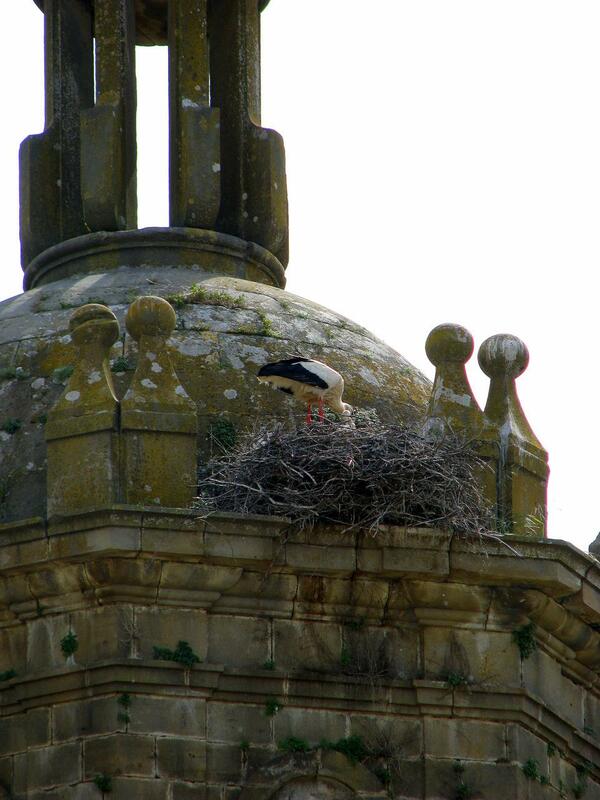 My first stork on top of the bell tower of the Church of the Crucifix. The Korean kids perform for the pilgrims in Puente la Reina. 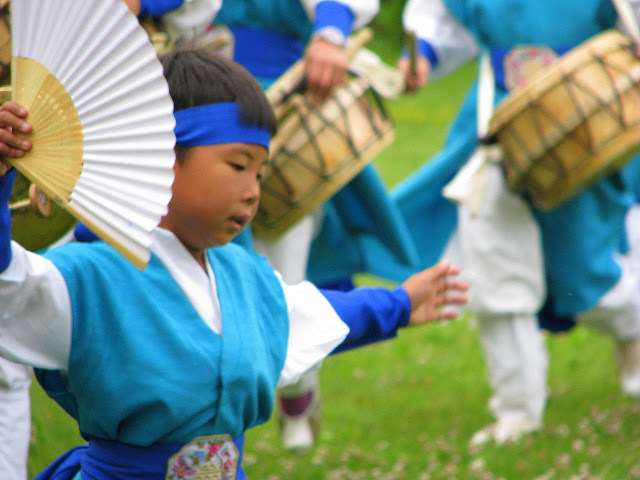 Korean dancers in Puente la Reina?!? Who would have thunk it?!? These and other pictures taken between Pamplona and Puente la Reina have been added to my 2011 Camino de Santiago Google Photos album.